As we reached the midpoint in the band’s trip to Florida, we explored the wonder and excitement of Walt Disney’s Magic Kingdom. The highlight of the band’s day was getting the honor of marching in front of the Disney crowd. The band marched the parade route which included Main Street, USA. Unfortunately, Jenny and I misunderstood that the band was marching as part of the pre-parade and not the actual Disney Festival of Fantasy Parade, so were missed seeing their performance by just a few minutes. Throughout the day Jenny and I were able to ride Carousel of Progress, The Many Adventures of Winnie the Pooh, Walt Disney World Railroad, Under the Sea: The Journey of the Little Mermaid, Jungle Cruise, It’s a Small World, Haunted Mansion and Pirates of the Caribbean. Each and everyone of the rides were filled with immersive themes and great stories. Seven Dwarfs Mine Train is the newest ride in the park, opening just last week. I would have loved to have gotten this coaster credit, but the line was over two-hours all day long. The two coasters that I was able to ride were Space Mountain and Big Thunder Mountain Railroad. Both were themed with a lot of Disney magic. We also took in the shows of the Hall of Presidents, Monsters, Inc. Laugh Floor and the Enchanted Tiki Room. As the sun began to set, Jenny and I made our way to Main Street, USA and Cinderella Castle to see the evening’s concluding events. Large crowds surrounded the street to watch the Main Street Electrical Parade and it was hard for us to get a good view. Next was the light and video show Magic to Light Up the Night. 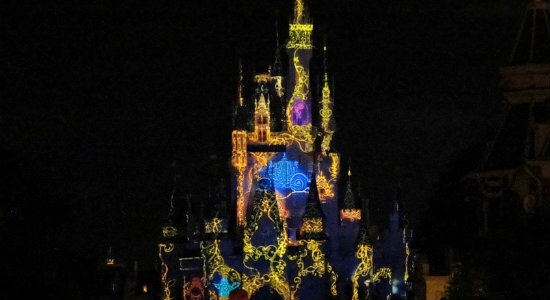 High power video was projected onto the castle and accompanied with music and honoring the art of Disney storytelling. 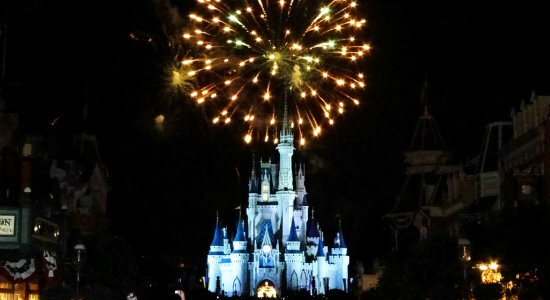 The day concluded with the Wishes nighttime spectacular. Both of these Main Street, USA shows were amazing. Full of music, energy and all the Disney magic you would expect. Click here to see all of my pictures from the Magic Kingdom. We all had a great day at the Magic Kingdom. Now we are looking forward to our visit to Universal Studios tomorrow.